This is it! The new and improved, Deluxe Tunnels & Trolls. T&T is the second ever fantasy role playing game, and the easiest to use. This book contains everything you need to play the game solo (with the many solo adventures) or with a group of friends. Includes a lot of extra material and descriptions of the worlds played in by the designer and his friends back in the late 1970's. The first 166 pages are the core rules, followed by the Elaborations section which has optional rules and systems you can pick and choose from to add to your T&T games. There is also a 16 page full color section which includes color maps of Trollworld, Khazan, Khosht and Knor along with other paintings and maps. There is a 50 page Trollworld section that includes descriptions of locations on every major continent and three cities, plus a detailed Trollworld timeline. 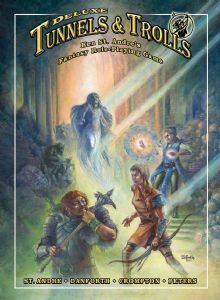 The book also includes a solo adventure that gives you the chance to bring dead characters back to life and a GM adventure on the continent of Zorr, plus a detailed weapons glossary and much much more - over 380 pages of material.